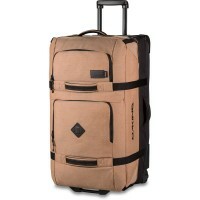 Dakine Split Roller Trolley 110L is a spacious, sporty rolling suitcase with many functional details. 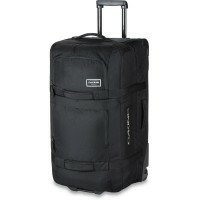 With 110 liters provides the Dakine Soft Case suitcase incredible amount of space and storage space for your luggage. Thanks to the modern split-level design, it can be completely open, and are practical load up on both sides. 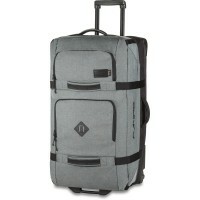 Opens gives you the Dakine Split Roller 110L trunk a large compartment in the lower shell. In the upper flexible part you allow transparent mesh partitions an ordered packing with an overview of your holiday. 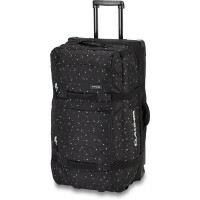 In addition, the Dakine Split Roller 110L trolley has an inside pocket where you store dirty laundry, shoes or your ski / snowboard boots traveling separately. practical subjects split also provides for not completely filled travel bag that the content does not slip. A hidden ID card pocket for documents and a quickly access external pocket zip round the Dakine Split Roller functional from. 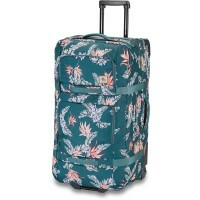 Thanks to its convenient stowable telescopic handle and high quality urethane wheels can be drawn to the large Dakine Split Roller Suitcase comfortable even with heavy luggage. The roles of the Pocket trolleys are interchangeable. With the lateral lashing you can sport suitcase traveling resistant at different filling and securely sealed. For additional stability, the provides innovative split Wing® Design that is unique in this form on the market. The Split-Wing® enhancement makes the Dakine Split Roller 110L very robust and stable and allows for convenient storage, because the suitcase bag can be folded flat. On long holiday trips you have the Dakine Split Roller Trolley 110L a stylish and competent travel bag with wheels at your side. 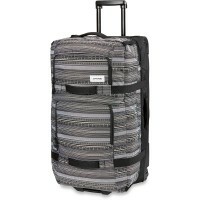 The patterned compression straps with attached handles and a stitched Dakine logo patch give the Dakine Split Roller suitcases a sporty elegant look and brand recognition. 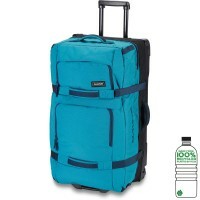 Tip: The Dakine Split Roller 110L is available in numerous color designs for men and women. For flexible travel and compact luggage, we recommend the Dakine Split Roller 85L. Customer evaluation for "Dakine Split Roller 110L Trolley / Suitcase Pine Trees Pet"